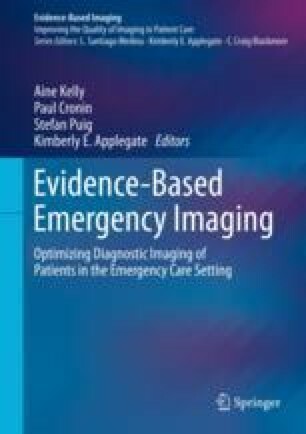 Inappropriate use of diagnostic imaging in the emergency department setting is a growing concern. Multiple factors drive imaging utilization in the ED, and diagnostic imaging use has increased dramatically in the past two decades. Medical radiation now accounts for the largest percent of artificial exposure to ionizing radiation in the USA, and while a direct link between radiation exposure from imaging and cancer development has not been proven, there is increasing concern about the potential health effects of repeated exposure to medical radiation, especially in the pediatric population. Incidental findings are common and can be difficult to communicate and manage. Several methods have been proposed to reduce inappropriate imaging utilization, and clinical decision support integration with computerized order entry was recently mandated by the US Department of Health and Human Services. Further study into the impact of clinical decision support systems and radiologist-driven educational interventions is warranted, and development of guidelines for management of incidental findings is encouraged. Organization for Economic Co-Operation and Development. OECD Health Statistics 2014: How does the United States compare? http://www.oecd.org/unitedstates/Briefing-Note-UNITED-STATES02914.pdf.